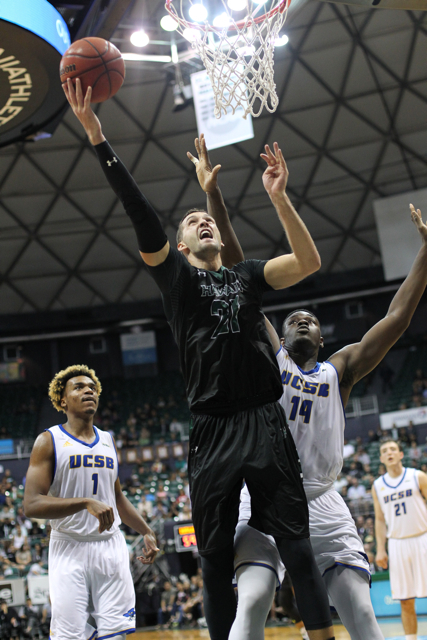 Based on losses alone, the University of Hawai’i basketball team could be viewed as part of a three-way tie atop the Big West Conference standings. The Rainbow Warriors are 13-6 overall and 4-2 in the conference. Technically, they are currently in third place, but only because UC Davis (5-2) and UC Santa Barbara (5-2) have more wins. Long Beach State (6-3) was in first place earlier in the week, but UC Irvine beat the 49ers, 75-68, on Wednesday. Bottom line, the Warriors are still in the lead pack, despite a 69-66 home loss to Cal State Fullerton on Saturday. The Warriors will need to pick up the pace this week if they want to maintain pace near the top. After playing four consecutive games at home, spread over three weeks, the Warriors will play two road games this week – at UC Santa Barbara on Thursday, then at Cal Poly on Saturday. 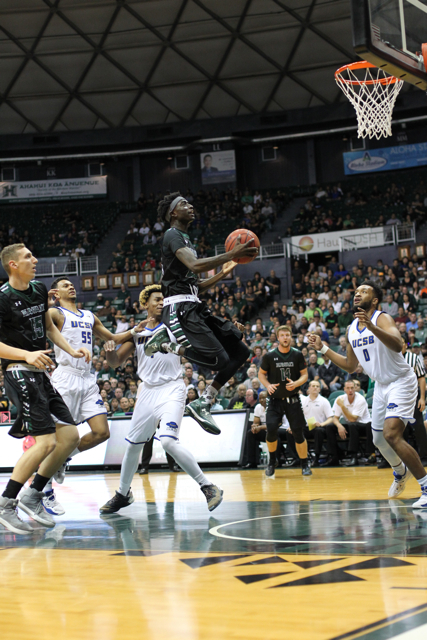 Hawai’i already earned home victories over both UCSB and Cal Poly in January. Thursday’s game is scheduled to start around 5 p.m. (Hawai’i time) at the Thunderdome in Santa Barbara, Calif.
UCSB is 16-5 overall, and is one of the top “turnaround” teams in the country after finishing 6-22 last season. Since losing, 77-76, at Hawai’i on January 13, the Gauchos have won four in a row. 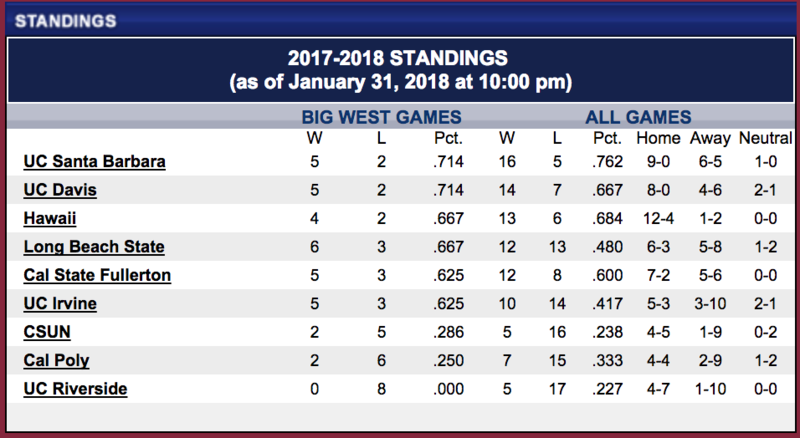 What’s more, UCSB is 9-0 in the Thunderdome this season, and is the Big West’s top rated team in the Ratings Percentage Index (RPI) at 83 (Hawai’i is at 178). The Gauchos have a solid starting five that accounts for 86.6 percent of the team’s points. Max Heidegger, a 6-foot-2 sophomore guard, leads the Big West in scoring at 21.0 points per game. He is also the conference’s most prolific 3-point shooter with 65. No other player in the conference has more than 45. 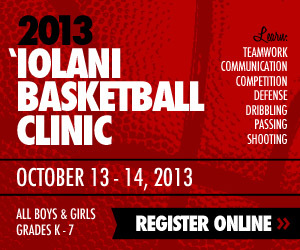 He scored 22 in the loss at Hawai’i. UCSB also has the top rebounder in the conference in Leland King II, a 6-7 senior forward who is averaging 15.5 points and 10.5 rebounds per game. He has 10 double-doubles this season. Jalen Canty, a 6-8 senior forward/center, is averaging 12.5 points and 7.7 rebounds per game and has a .571 field goal percentage. Gabe Vincent, a 6-3 senior guard who already has more than 1,200 points in his UCSB career, is averaging 11.2 points and 3.4 assists per game. Marcus Jackson, a 6-3 senior point guard, is averaging 8.2 points per game and is second in the Big West in assists at 4.4 per game. 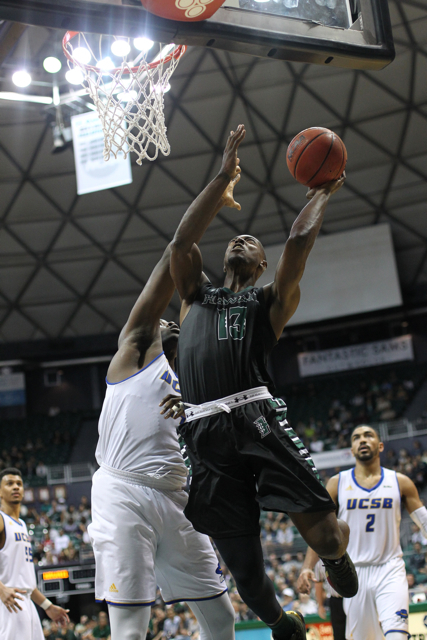 Hawai’i is led by 6-7 senior forward Mike Thomas, who is averaging 13.1 points and 6.1 rebounds per game, and leads the Big West in field goal percentage at .612. Junior guard Sheriff Drammeh is averaging 11.5 points, 3.7 rebounds and 2.2 assists per game. Senior forward Gibson Johnson is contributing 10.3 points and 5.2 rebounds per game. He scored 18 points on 8-of-9 shooting in the win over UCSB three weeks ago. Junior forward Jack Purchase is averaging 7.6 points, 4.9 rebounds and 2.4 assists per game, and leads the team with 31 3-pointers. Freshman point guard Drew Buggs is averaging 7.4 points and 3.8 assists per game. The Warriors have played the last two games without junior guard Brocke Stepteau, who is recovering from a finger injury on his right (shooting) hand. He will likely be a game-time decision on Thursday. He had 12 points and five assists in the win over UCSB. Where: The Thunderdome (4,200) – Santa Barbara, Calif. This is going to be a very tough road game. UCSB has been stellar at home this year. Hope we can get back on track and compete for the title. After that home loss we are very likely out of the running, even if we split this road trip like I expect. That last minute home loss to CSF all but sealed our fate. I’m still getting over that loss…SUCH a winnable game, and how huge was that wide open layup miss by Gibson Johnson? Really bit us in the behind later. He makes that and we win. Not sure how you can be that tall and miss such a wide open layup but this team isn’t perfect, I guess. Without Late-clock Brock, we won’t stand much of a chance tomorrow night. We shouldn’t need him Saturday so I don’t see the Coaches rushing him off the bench for a tough road game which has the odds already stacked against us. ^^^ I wouldn’t give up that fast. The Fullerton loss was definitely a bad one but I don’t think the season is over yet. I agree that the next UCSB game is probably a loss, but I think the game after that Cal Poly is a win. After that, the only game that might be close to guarantee loss is on the road at Davis. If UH can win everything else, including a payback by winning at Fullerton, they are right back at the top. At the very worst they could be second place and that is a good position for Big West Tournament. The key this year is to get a 1 or 2 seed for Big West Tournament to play either CSUN or Riverside in first round. Those two are like automatic wins for this year.